The following lists the MINIMUM standards for your computer when running PhotonTrader Pro. Pentium IV 3.0 GHz or higher with HyperThreading. 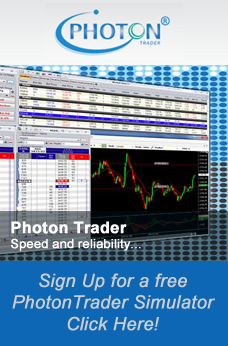 Note: Please contact the PhotonTrader Support Desk if you use an Internet firewall or router. Some Internet security and anti-spyware programs may interfere with the PhotonTrader. Please contact the software provider or the PhotonTrader Support Desk for further assistance. The following lists the MINIMUM standards for your computer when running PhotonTrader. Warning: It is not advisable to trade using a wireless connection of any sort. Note: If you use an Internet firewall or router: Please contact the PhotonTrader Support Desk for further info on port configuration. Also, some Internet security and spyware monitoring programs may interfere with the PhotonTrader application’s connection. Please contact the software provider or the PhotonTrader Support Desk for further assistance. Thank you for your interest in PhotonTrader. To download the simulator, please click the image above.